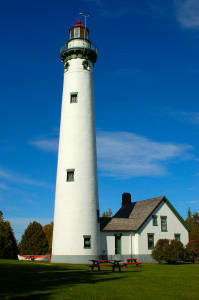 The Presque Isle Light Station includes three historic buildings. The light tower, which connects to a keeper’s dwelling, was built in 1870 and is the tallest lighthouse tower accessible by the public on the Great Lakes. An unattached keeper’s residence, constructed in 1905, has been painstakingly restored and now serves as a museum. The buildings are situated on a 99-acre township park featuring a playground, picnic area, pavilion and nature trails. The park is open to the public from mid-May to mid-October. A gift shop is located in the original keeper’s quarters. Visitors, for a nominal fee, may also climb the 130 steps to the top of the tower for a breathtaking view. The buildings and grounds are open mid-May through mid-October, from 9am until 6pm, daily. The 1905 House is open from Memorial Day through Labor Day, 11am to 5pm, Tuesday through Saturday; 1pm to 5pm Sunday; closed Mondays. For more information, visit the township web site at www.presqueisletownship.org or call (989) 595-5419.